The Thirties saw the growth of Shanty Towns caused by the Great Depression, Dust Storms, Radical Politics Around The World, and what many consider an upside down world where bank robbers were seen as hero's not villains. If you have $100 Converted from 1930 to 2005 it would be equivalent to $1204.42 today "If You Had 1 billion dollars then it would now be worth 12 billion dollars." Smoot-HawleyTariff bill is passed, raising duties on imports. The very first FIFA World Cup is held in Uruguay. Uruguay defeats Argentina to win the title. Mahatma Gandhi and his followers march 200 miles to the salt beds of Jalalpur. The popular cartoon character "Betty Boop" makes her debut in "Dizzy Dishes." US suffers worst ever drought in its history, leading to the Dust Bowl years. Australia becomes independent from England. Francis Scott Key's "Star Spangled Banner" is officially named the United States' national anthem. Empire State Building is completed. The Second Spanish Republic is created. The Great Depression influences economies worldwide. More than 24.5% of the population are unemployed in the United States. Over 20% of the workforce are unemployed in the United Kingdom. The Canadian unemployment reached 27%. The German unemployment rate reached nearly 30%. Amelia Earhart becomes the first female aviator to successfully fly solo across the Atlantic Ocean. Notorious gangster Al Capone is convicted of Income Tax Evasion. Franklin D. Roosevelt is elected as the President of the United States. Strong winds strip the topsoil from the drought affected farms in the Midwest. The first successful solo around-the-world flight is completed by Wiley Post. Unemployment in the United States reaches its highest level in the winter of 1932 / 1933 with nearly 1 in 3 people unemployed. The fabled "Loch Ness Monster" is spotted in Scotland for the first time. Adolf Hitler announces the state sponsored "People's Car" - "Volkswagen"
The 21st Amendment is passed repealing the 18th Amendment ending prohibition of alcohol. The machine gun is demonstrated by a Japanese scientist. Disney introduces the character of "Donald Duck" in the animated short "The Little Wise Hen." Due to poverty around the world, political extremism including Fascism, Nazism, and extreme Communism gains followers. John Herbert Dillinger ( Public Enemy Number 1 ) bank robber dies after a shoot out with the FBI. Bonnie Parker and Clyde Barrow die after a shoot out with FBI. Slum Clearance begins in New York and other major US cities. The Alcatraz Federal Penitentiary, also known as "The Rock," opens near San Francisco and is used to hold some of the more dangerous and well-known U.S. criminals. The Boulder (Hoover) Dam is completed. Penguin produces their first paperback books, bringing affordable modern literature to the masses. Emergency Relief Appropriation Act creates the WPA or Works Progress Administration to provide millions of jobs. The United States Social Security Act is signed into law. Legendary player Babe Ruth retires from the sport of baseball after hitting his 714th home-run. President Roosevelt's Revenue Act (Wealth Tax Act) begins. King Edward VIII abdicates to marry American divorcee Wallis Simpson. Margaret Mitchell's epic Civil War novel "Gone With the Wind" is published. Jesse Owens wins 4 Gold medals at the Berlin Olympics. The first public television broadcasts begin in London. The Spanish Civil War begins during July and does not end until 1939. Prince Albert, the Duke of York, becomes King George VI of England in May. Amelia Mary Earhart disappeared over the Pacific Ocean during a circumnavigation flight attempt. The United Kingdom's "999" Emergency Telephone Service begins operations. The Memorial Day Massacre takes place in Chicago. Japan Invades China and seizes Peking, Tietsin, Nanjing, Shanghai and Hangchow. Seabiscuit beats War Admiral in the "Race of the Century." Orson Welles' radio adaptation of The War of the Worlds is broadcast. Aviator Howard Hughes flies around the world in 3 days and 19 hours, setting a new record. The Fair Labor Standards Act ( Wages and Hours Bill ) passes. Germany begins its persecution of Jews. The very first "Superman" comic is issued by Action Comics. These Year In History mugs make great gifts for multiple occasions including birthdays and retirements. 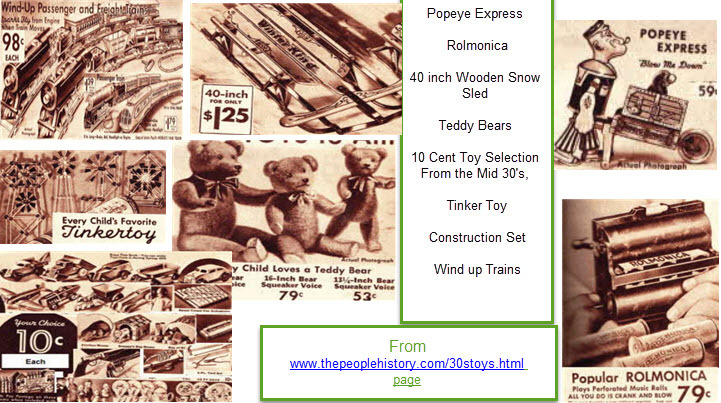 ( From Our Back In Time History Related Gift Collection ) Choose the year from 1920 to 2009. Each mug features news events, prices, popular movies and music, and famous names born that year. Each mug also has a selection of images in the center that feature items that may have been for sale in the chose year like clothes, accessories, appliances, electronics, furniture, and toys. Germany attacks Poland starting World War II. Lou Gehrig retires from Major League Baseball after being diagnosed with ALS. Physicists Albert Einstein and Leo Szilard send a letter to President Roosevelt urging the United States to invest time and money into the secret development of nuclear weapons before Germany developed the technology first. Dictator Francisco Franco conquers Madrid ending the Spanish Civil War. The beloved film starring Judy Garland "The Wizard of Oz" premieres. The World's Fair opens in New York. The 30's also provided a strange phenomenon never repeated where bank robbers and murderers were thought of as celebrities ( a sort of modern Robin Hood ) which in truthfulness they did not rob from the rich to give to the poor just to rob and murder any who got in their way. Clothing styles were less extravagant for the most part during the 30s. However, you could still tell between the "haves" and "have nots" of this time. Some of the more affluent type of dress was presented by models in issues of the women's magazine Good Housekeeping. Since the 30s was the decade of recovering from the 1929 Great Depression and stock market crash, companies started researching and implementing cheaper means of clothing manufacturing. New materials that were cheaper to process had been created during this decade to replace more expensive materials. Joe DiMaggio starts his career at the New York Yankees taking the crown over from Babe Ruth who retires. To help with falling attendance due to the depression, night games are started. National Collegiate Athletic Association NCAA holds first championship tourney in 1939 which Oregon won. As it's popularity grew, teams in Britain and later the rest of the world bought in managers who instituted a greater degree of Professionalism, tactics and stricter Training regimes taking the game to new levels. The first world cup is played in Uruguay in 1930 which the home team won. 1930's when the airships LZ127 Graf Zeppelin and LZ129 Hindenburg operated regular transatlantic passenger flights between Germany and both North and South America. Homes were created to help those-usually women during that time-to do house chores easier. 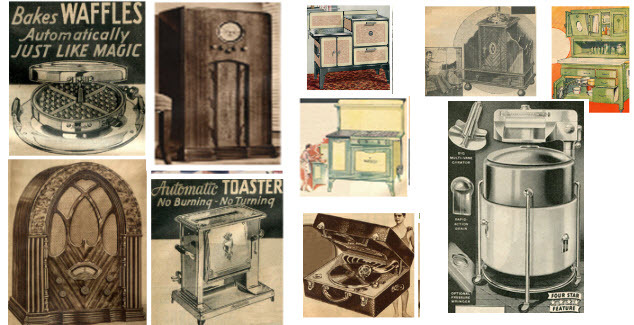 Electric ranges (or gas ones) and electric washers were very popular and built with most homes during these times.